I've always been enamored by retail. As a planner, there's something about a physical space filled with live consumers (err, shoppers) that fills me with enthusiasm. Just by walking into a store, you can feel the impact of branding, layout, merchandising, customer service, and a designed shopping experience. And in some cases, there's the added feeling of being inside something magical. So it is, of course, unfortunate when some of that magic is taken away. 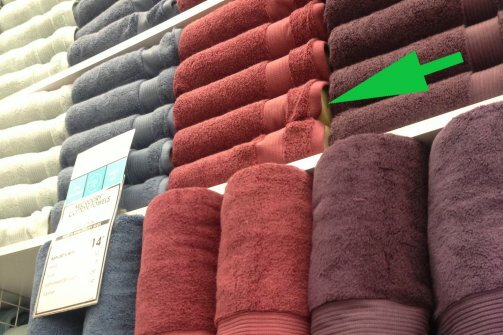 Bed Bath & Beyond's "Towel-gate"
In the April 1, 2013 issue of MacLean's, Anne Kingston writes about the stink that was caused when people discovered Bed Bath & Beyond's rainbow-like towel displays are faked. Instead of an actual stack of hundreds of towels, a handful of towels are weaved through a bracket to create the same effect. Like Kingston, I immediately thought to mysef — why? Then it hit me. In retail, it's all about theatre. Bed Bath & Beyond was using a retail concept called abundance. Stores use actual product displays (or fake ones) to create the feeling of abundance — lots of products lining the shelves. This means aisles are packed, empty space is rare, and shoppers feel like they're wading through a cornucopia of good things. Abundance doesn't necessarily equal variety either. As I've written about in the past, too much choice doesn't influence people to buy more. Abundance simply means plenty. 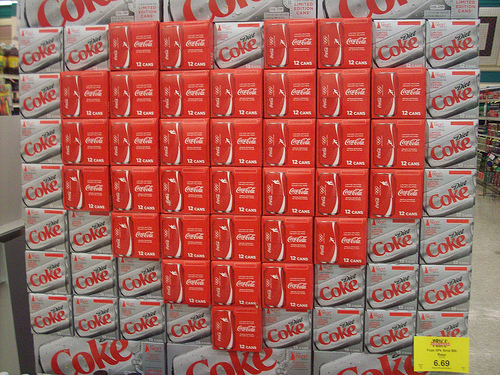 So instead of displaying one Coke can and hiding the rest in a freezer, a store would display hundreds of Coke cans. Instead of storing most merchandise in the back, a store would move everything to the front, and display it in a compelling way. One… it makes people feel like buying. According to Kingston's article, Barry Schwartz, a professor of social theory, says the sense of plenty triggers optimism and positive emotion in shoppers, which makes them buy. Translation: it simply feels better to see lots of stuff. Steve Hall, a retail display consultant, says "When there's a lot of something, it's easier to take one." Two… it increases the perception that shopping is a treasure hunt. Paco Underhill, former Coke marketer and now "retail anthropologist" (I love that term) says crowded floors create the expectation of aggressive discounting and the feeling of being on a treasure hunt. "When there are more things on the floor, there are more things to sort through." Three… it elevates the products. Seeing a rainbow of towels towering over you can make a $5 towel feel like something magical. Joe Mimran, creator of Joe Fresh, says "You can take a very basic item and when you see it repeated through the kaleidoscope of colour, you get transfixed. It's elevated." What about the concept of scarcity? Schwartz says scarcity has the opposite effect of abundance. Scarcity, he says, triggers a defensive, self-preservation-type behaviour that promotes hunkering down with what you have instead of buying something new. That said, there are advantages to making shoppers feel like a product is scarce. One… it makes you want to buy now. When you feel like something won't be there the next time, the decision to buy is easier. It increases anxiety and prompts an immediate decision. Think about temporary retail programs like flash sales, pop-up stores, and limited edition lines as examples of scarcity. Two… it elevates the craftsmanship of the product. 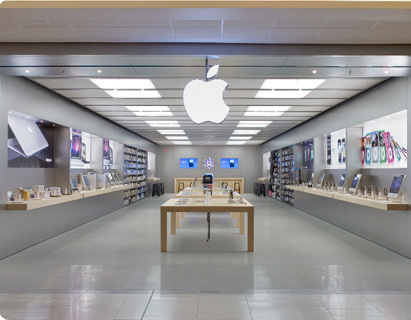 Think about more expensive and elegantly-designed products — like Apple. Stores display them like a museum displays artifacts: with care and theatre. So the next time you walk into a store, take a moment to think about their approach to retail theatre. Are they using abundance? Are they using scarcity? But most importantly — is it working?